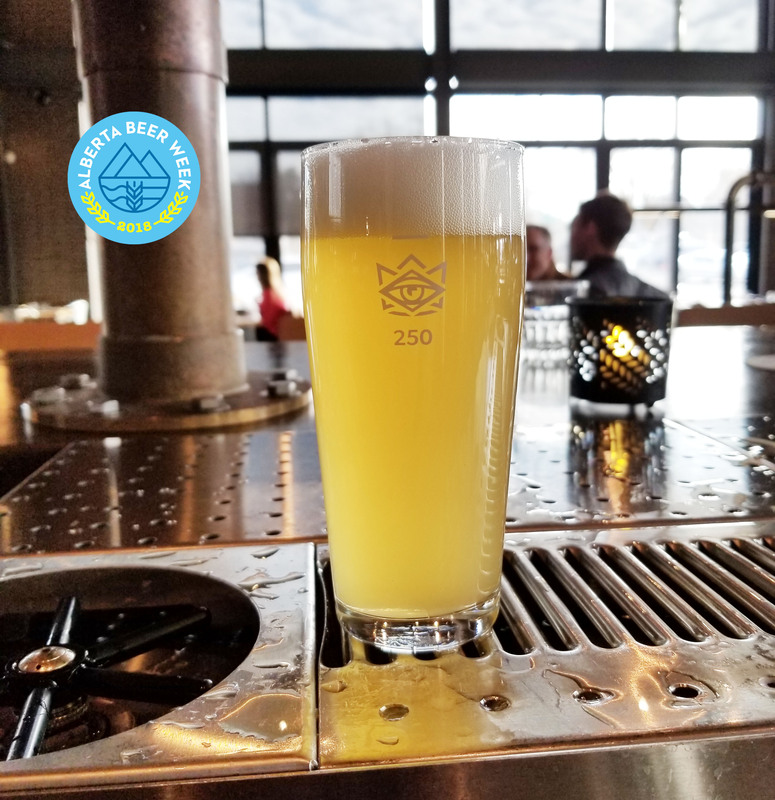 One of our more popular beers is ZestyZee, a light, summer wheat beer that we brew from March to September. It’s crisp, light, and refreshing with a delightful expression of banana aroma and flavors, and a gentle tart bite in the finish. As with all of our beers there is a story behind ZestyZee, as well as some interesting brewing details that we’d like to share. ZestyZee in all of its wheaty glory! When we started the brewery we knew we wanted to serve a number of different wheat beers, and the first one we made was ZestyZee. Initially it was called ZES, as that was the secret code name for the beer (see our philosophy on beer naming here). We also knew we were brewing it for the summer season. Given the timing of our soft opening (July 2017) we opted to to make a very light, refreshing beer that would be great on the patio. We elected to use German ingredients (malt, hops, and yeast) and traditional brewing techniques (step-mashing, in particular) in order to achieve our goal of making a refreshing wheat beer with banana notes, light body, and a crisp finish. While we don’t use styles to describe our beers, we are certainly aware of and inspired by them. In the case of ZestyZee, we were absolutely inspired by classic German Hefeweizens, and used ingredients and techniques to capture elements of our favorite beers. We also wanted to brew a wheat beer that was on the lighter side, not quite at session-strength of 4% ABV, but definitely lower than 5%. ZestyZee tends to end up in the 4.5% range which seem to be just right to balance its bold flavors and extreme drinkability. 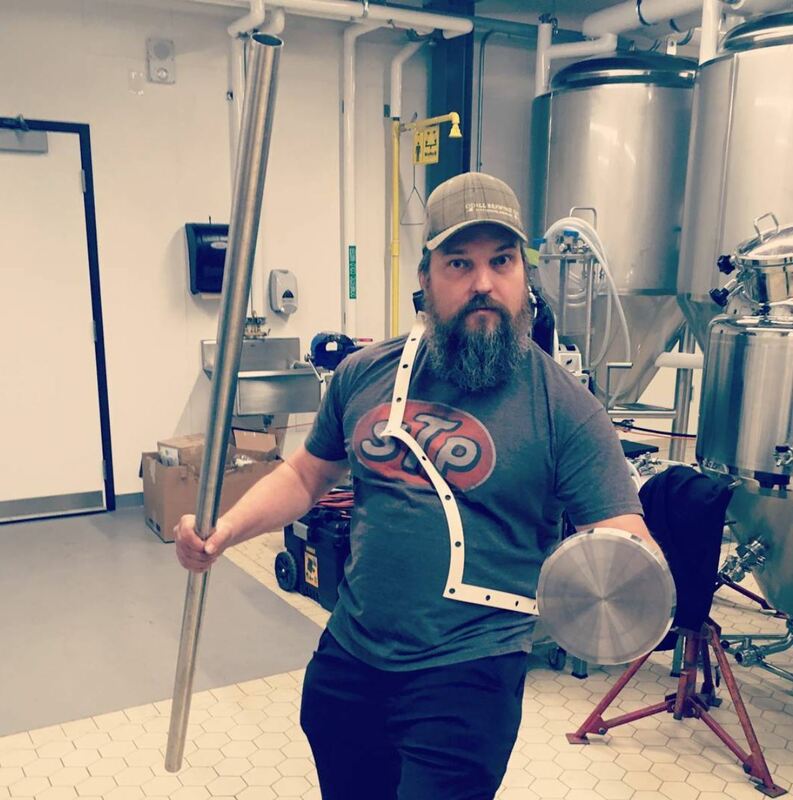 ZestyZee pretending to be a spartan warrior armed with surplus brewing hardware. The final thing to mention would be the origin of the name ZestyZee. Like many breweries, at Blind Enthusiasm we combine very serious attention to quality of our beer and the process making it with lots of levity in our work place. We love what we do, we have fun doing it, and we tend to joke around quite a bit. 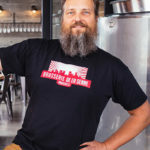 I grudgingly admit that I’m one of the main offenders doing silly things in the brewery (photographic evidence above), and that led to me earning the title of ZestyZee. Doug and Rob (our two head brewers) trialed a number of possible nicknames (e.g. Whizzy G, Zesty Whiz) for me; we all concluded that ZestyZee would be the best. We also thought it would be a great name for our wheat beer (and the others we came up with would be TERRIBLE names for a wheat beer). I saw a ray of hope to dodge my nickname when another G.Z. (Greg Zeniuk) joined our brewing team, but he was quickly named Tandy by Rob, for reasons we’ll discuss another time. So, that concludes the story of ZestyZee, a beer that remains close to our hearts and often in our glass.